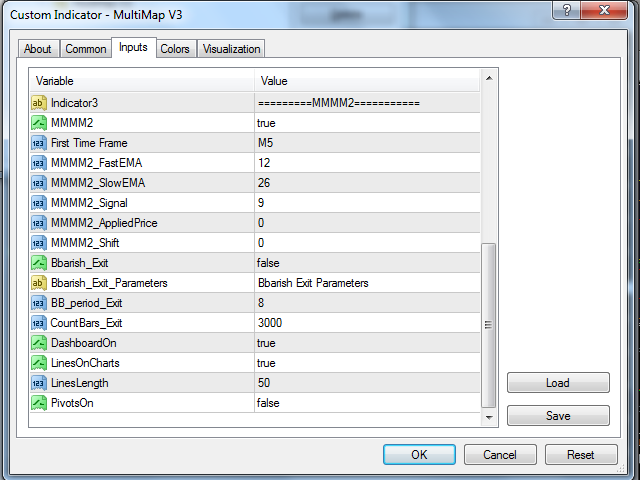 The indicator generates entry signals based on the combination of Multi Time Frame conditions of 1 set of moving average and 2 sets of MACD. The importance of the 2 sets of MACD is for using it as a confirmation filter so that the trades generated are those with stronger movement. For example, if in a sideways market the MACD of M5 chart is showing a downtrend but the higher timeframe of M15 chart is indicating an uptrend, then the entry signal will not be generated. In the same way, the MOVING AVERAGE FILTER on a M5 chart can be set for the higher timeframe, so that it acts as a more robust filter. 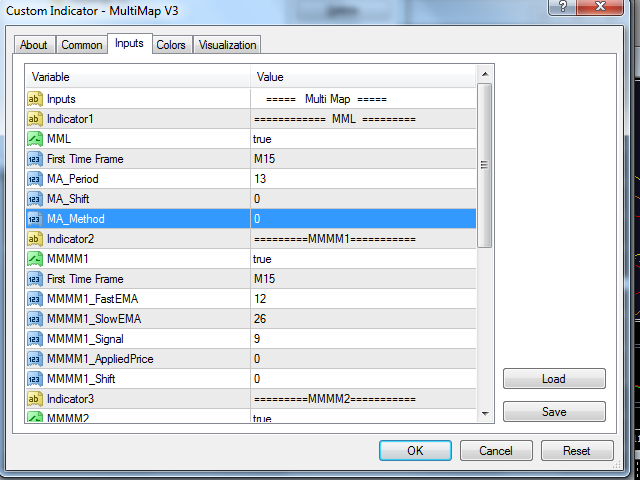 For example, if a trader is watching the M5 charts, the MA FILTER can be set to work on M15 or any higher timeframe. This way, the price needs to be in an uptrend on both M5 AND M15 timeframes, and only then will a buy signal be generated. The system will only generate a BUY signal if the MA FILTER of a higher timeframe is selected and the two sets of MACD of the higher timeframe are both in an uptrend. The combination of the three criteria would be a confirmed trade. Therefore, many false signals on the lower timeframes can be avoided. The entry would be shown on charts, by way of ARROW signal. 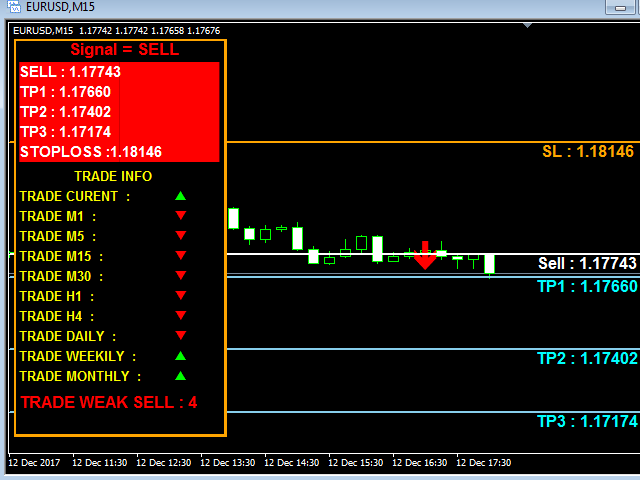 The multiple targets and stop loss levels are well displayed on the charts for convenience. 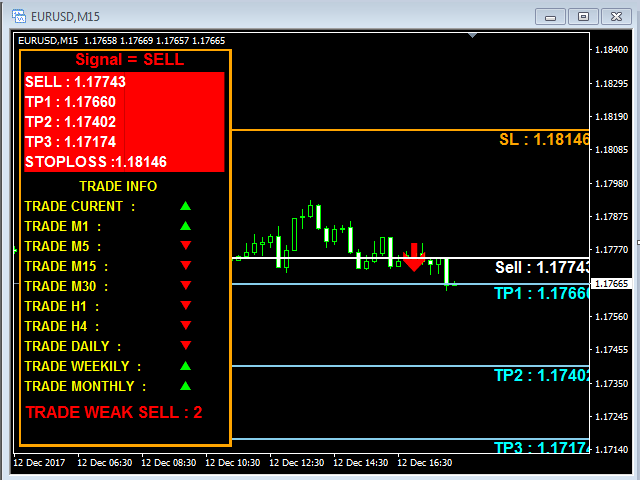 FirstTimeFrame = M15 - this can be selected from a dropdown as listed below. It is recommended to select a slightly higher timeframe for causing less fluctuations and whipsaws. 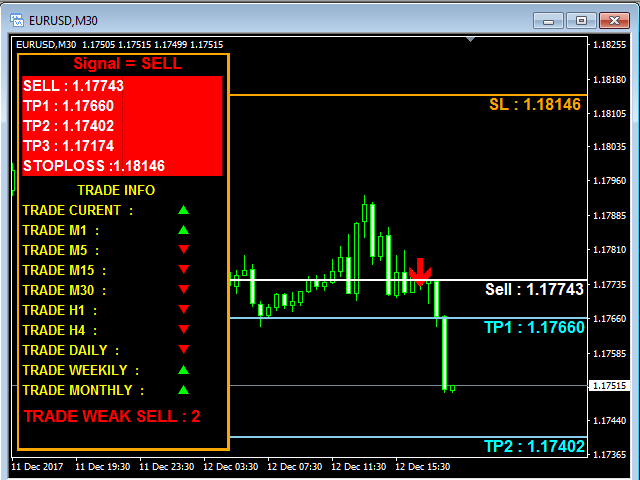 FirstTimeFrame = M15 - this can be selected from a dropdown as listed below. It is recommended to select a slightly higher timeframe for causing fewer fluctuations and whipsaws. 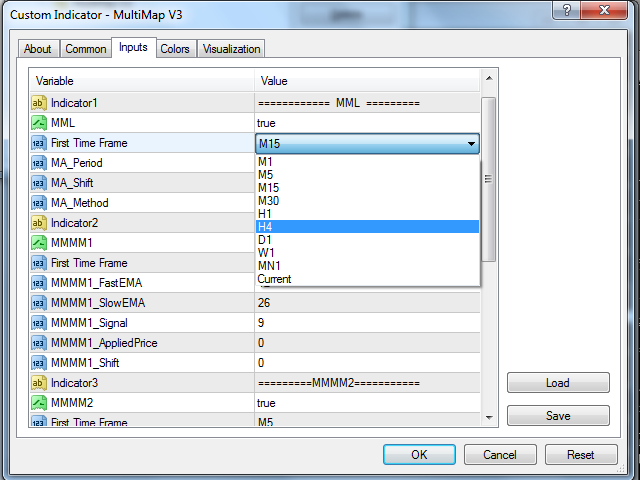 FirstTimeFrame = M5 - this can be selected from a dropdown as listed below. It is recommended to select a slightly higher timeframe for causing less fluctuations and whipsaws. 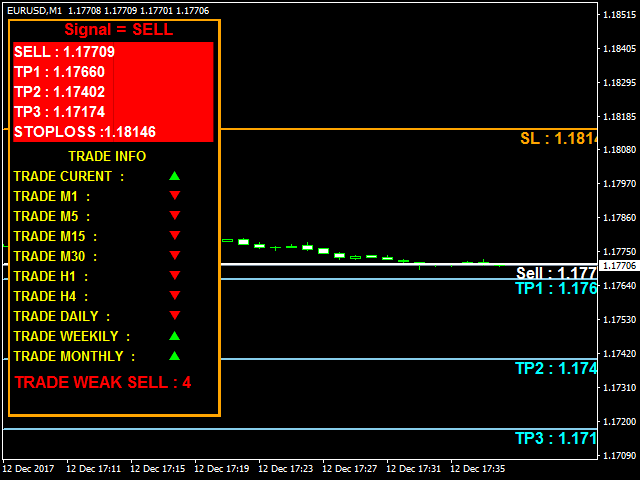 The quickest 80usd I wasted for a long time - down 550 pips on first afternoon. A reliable indicator that delivers good signals even at low Timeframe; ideal for scalping. 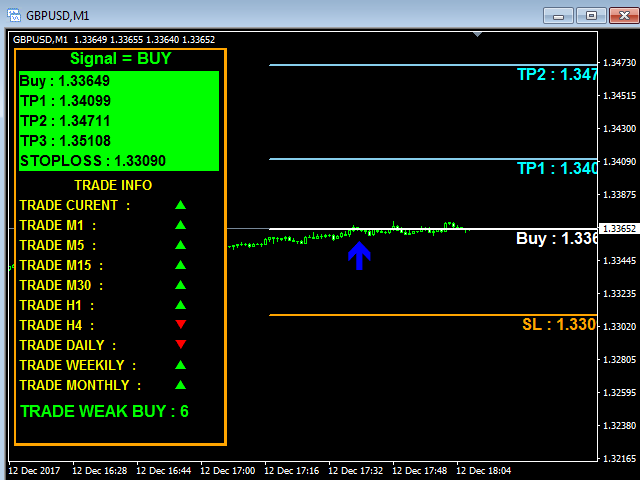 TPs are Daily Pivot brands. You should select the settings mentioned on the Customer Support Community page. First technical difficulties were discussed and solved quickly and comprehensively by the customer service. The conversation is always friendly and respectful. A good indicator and good customer service. I can recommend this company.